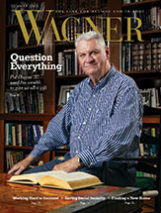 Wagner College was little more than a combination high school and junior college when it moved from Rochester, New York, to rural Staten Island in 1918. The Grymes Hill property included six buildings that would serve the small school well. All that was lacking was a home for Wagner's new president, Adolf Holthusen, his wife, Clara (shown here in a 1916 photo), and their three young children, Ave, John, and Peggy. That home, completed in time for Wagner's Staten Island re-launch in September 1918, is known today as Kairos House. Times were tough those first few years. World War I had not yet ended, and commodities like coal and fuel oil were hard to get. 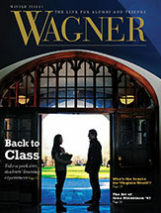 To keep the furnaces going that first winter, Wagner students and faculty members formed work gangs to cut down trees on the school grounds. Gelt was also short in the young college's coffers. Just 42 students had enrolled for the 1918-19 school year, many of them on scholarships, and little cash had come along with the college from Rochester. To survive its hardships, the college community banded together. The women of Trinity Lutheran Church in Stapleton, Staten Island, donated much of the students' food, and the campus's unofficial cook and chief comforter was Clara Holthusen. According to her granddaughter, Cynthia Holthusen Sanford '65, Clara prepared many a Wagner College meal with her own hands, on her own stove, in her own kitchen at Kairos House. 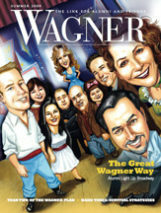 Today, the Holthusen home is still among us — holding Wagner's chapel and offices — and so are some of Clara Holthusen's cookie recipes, keeping alive in the 21st century the aromas and tastes that fed and comforted the hearty young collegians who helped establish our alma mater on Staten Island. Taste the Past: Clara Holthusen's recipes for ginger cookies and oatmeal cookies. The Wagner College president's house, today known as Kairos House, circa 1920.